16 Sep Filed under Entrepreneurship. Bookmark the permalink. 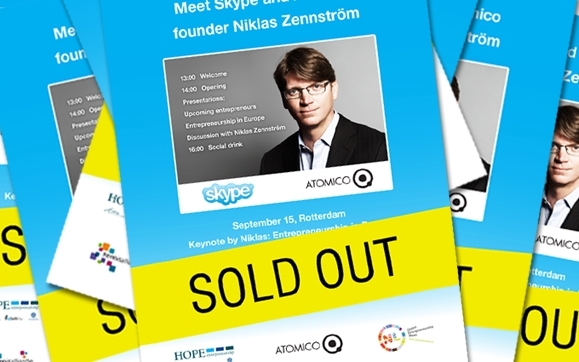 Niklas Zennström, the founder of Kazaa, Skype and Joost visited the Rotterdam School of Management. He does not only have an impressive track record as a billion-dollar entrepreneur. He is now sitting on the other side of the table, working as a Venture Capitalist with his Amsterdam-based Atomico Ventures where he has already invested in more than 30 hightech-companies. He started his first company Kazaa in Amsterdam 10 years ago after quitting his corporate job together with Janus Fries. But one week after that, the Dotcom-Crash started and they couldn’t get financing for Kazaa. Thus they started to work in the living room, hiring more and more people until the power consumption of all servers in the flat became too high. Kazaa was very popular among consumers, but although it was downloaded over 380 million times the company never made money. Instead they had to fight a 5-year legal battle but finally managed to get in business with the music industry again. With Skype he felt determined to make it successful as he has already experienced success before. Having the technology experience of Kazaa was the key enabler for the Skype peer-2-peer technology. At the beginning of Skype in 2003 nobody wanted to fund the company so they started to bootstrap and continued working. But as they grew they got phone calls from all the investor that had returned them before. Failure is the best market research, if you learn from the mistakes. For instance Google failed with its Google Video service but learned from it and decided that it would be smarter to buy Youtube because they couldnt compete with them. Innovation is the core concept behind rapid growth. The failure is healthy as the companies are pushing the boundaries of what is possible and what not. In fact, it is hard to find any success story that wasn’t in some way prepelled by adversity, as the story of Steve Jobs shows who had to leave Apple in the 1980s. China, India and Brazil could provide all the next generation game-changing business if they start to develop a risk-accepting attitude as it exists in the US. Smart and passionate people are the most important ingredient for success, having the dynamism of diverse and entrepreneurial people. It is very rare, that a single person can build a successful by theirself. All businesses that aspire to grow must address a huge market opportunity. solving a consumer or business pain point. If there no market there is no business. 00:47 What do you look for when investing in a company? 01:50 What did you want to become as a child? 02:30 What did you learn from working at big corporations? 03:37 Can you describe how you felt when you just started as an entrepreneur, when you were well underway and when you sold out to e-Bay? 06:24 How relevant are the BRIC countries for our future? Big credits to HOPE and the RSM for organizing this event.